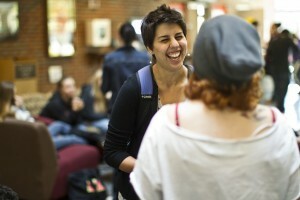 The Ohio Wesleyan community encourages the kind of exploration that compels students to make connections and create solutions. Our graduates are eager to affect the larger world and driven to satisfy their hungry minds. Single-discipline problems are rare, and the boundaries between disciplines are blurring. That’s why we teach our students to make connections – across disciplines, across continents, across cultures – that lead to synergies and solutions and make a difference in the world. Selecting the right college is tough for students, and you play a vital role in that process. For many of your students, Ohio Wesleyan might be the perfect fit. We're eager to meet you personally and show you all OWU has to offer. In the meantime, here are some helpful resources to get to know OWU. 90+ Majors - and the newest addition is Film Studies. Check out the full list. What's New @ OWU - the latest news on new majors, new sports, campus changes, and more. OWU is excited to share our story with you and will be hosting events for college/school/independent counselors across the country. We look forward to seeing you. Waltham, MA 02451-1202 8:00 - 9:30 a.m.
Waltham, MA 02451-1202 12:00 - 1:30 p.m.
New Canaan, CT 06840-4110 This event has been cancelled. We encourage interested counselors to attend the Connecticut Counselor Lunch (same day, same location) from 12:00 - 1:30 p.m.
New Canaan, CT 06840-4110 12:00 - 1:30 p.m.
Morristown, NJ 07960 8:00 - 9:30 a.m. Still have questions? Complete this information request form and we'll do our best to assist you.